California experienced a double-digit increase in the number of hate crimes between 2016 and 2017, and SLO County was no exception. According to a new report from the California Department of Justice, a total of 15 hate crime offenses were reported in the county last year, five times more than were reported in 2016. The hate crime offenses were connected with nine reported hate crime incidents in 2017. One incident can include multiple offenses, according to the report. The majority of those incidents were non-violent, according to data obtained from the DOJ. Five of them involved the destruction of property or graffiti. That includes the May 2017 vandalism of Templeton High School, where unknown suspects caused thousands of dollars of damage and spray-painted racial slurs and swastikas on the schools walls. That same month Mayor Heidi Harmon reported that an unknown suspect burned a rainbow flag and slashed a yard sign promoting civil rights displayed outside her home. Violence-related hate crimes last year included one report from the SLO Police Department involving a white suspect who reportedly used anti-African-American slurs during an assault in SLO in April, and an aggravated assault reported to by the state Department of Parks and Recreation at the Oceano Dunes in June that was reportedly motivated by anti-LGBTQ bias. NO PLACE FOR HATE? 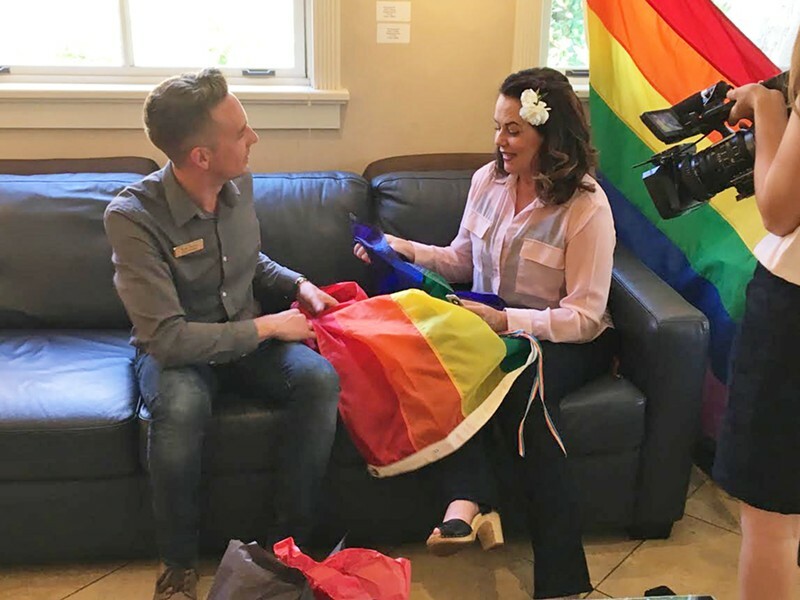 The burning of a Gay Pride flag displayed outside SLO Mayor Heidi Harmon's home was one of several hate crimes reported in the county in 2017. Of the nine total incidents in 2017, four were reported in the SLOPD's jurisdiction, another three were reported in SLO County Sheriff's Department jurisdiction. The remaining incidents were reported by State Parks and the Cal Poly Police Department. The majority of the hate crime incidents that year involved anti-black or anti-African-American sentiment, according to the data. The DOJ's report also stated that a total of three hate crime cases were referred to the SLO County District Attorney's Office in 2017. The office filed all three cases, one of which has already resulted in a conviction.